At the bottom of Denmark Hill on the eastern side stood a large house. It was built in the middle to late 16th century and the owner around 1656 was a Nicholas Deloes, described by Blanch as a citizen & merchant taylor of London. 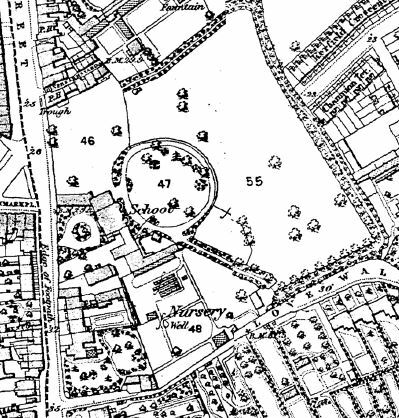 This extract from Dewhirst’s Map of Camberwell published in 1842 shows the estate. This extract from the Ordnance Survey County Series 1874-1877 shows the extent of the grounds which extended from Denmark Hill in the west to a line ending just before todays Kerfield Crescent and from roughly just south of the Joiners Arms in the north to Love Walk in the South. 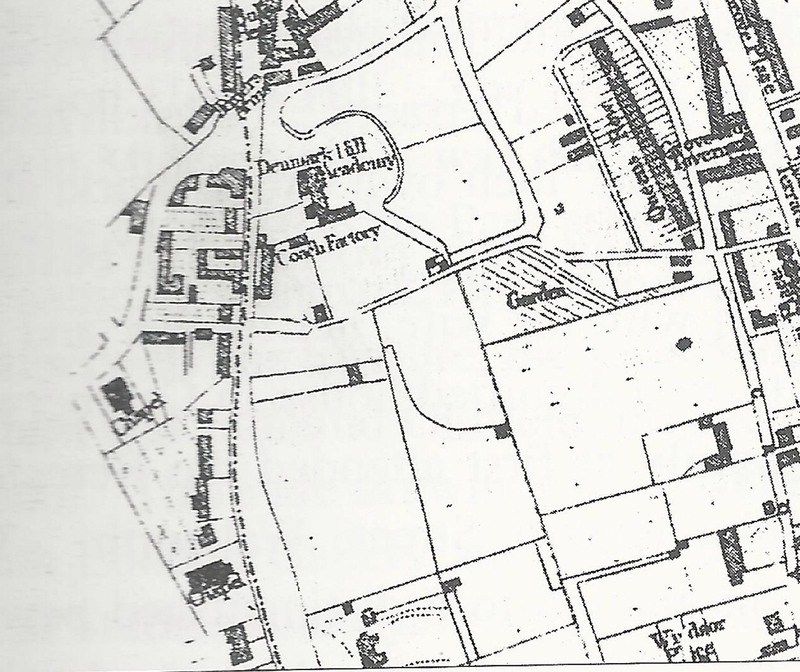 At the time this map was drawn the land and buildings were used as a school. Merchant Taylors was a medieval guild designed to protect working tailors. 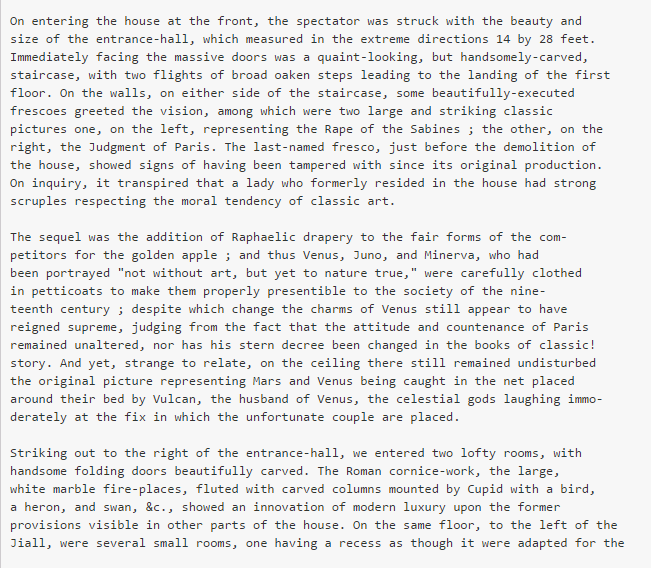 He let the house and the three acres of pastureland to a William Mollett who in turn let it to a John Novell. I could not find any information of these gentlemen. It is possible that the house was called Denmark Hill House, it is referrred as that in one source I have. At some point the house was occupied by Sir Piercy Brett. 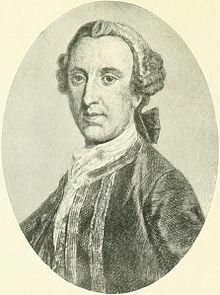 He lived from 1709 and died 14 October 1781 and was an officer in the Royal Navy promoted to Captain of HMS Centurion part of George Ansons’s command of eight ships in a mission to disrupt or capture Spain’s Pacific possesions. then Rear Admiral in 1762 and a full Admiral in 1778. He was also an MP for Queenborough 1754-1774. The smaller house on the estate was let over 8 years to a Mrs Carpenter. The next date we know about is Michelmas Day, 1784 when Mary Sharpe, who was the only daughter and heiress of her father Fane William Sharpe of East Barnet and MP for Callington from 1756-1768- a rotten borough abolished in the Reform Act of 1832. She owned the property and on this date let the estate to James Mills for 21 years on a repairing lease. This meant that Mr Mills had to put in new windows, doors, fire-places, enlarge the kitchen, repair with new lead the gutters, repair existing chimneys , take down the wall on Denmark Hill and replace with new gates and repair the fencing next to Mr Crespigny’s property on Love Walk. For all this he would pay no rent for three years. In 1798 the property was sold to Mr Douglas and he in turn after a couple of years sold it to Mr John Perkins, the chief clerk of the brewery Barclay Perkins. They took on the Anchor Brewery located in Southwark. It has been there since 1616 and from 1781 was operated by Barclay Perkins who merged with Courage in 1955. Mr Perkins was a great friend of Dr Johnson whom it is said paid many visits – a walk in the grounds was known as Dr Johnson’s Walk. This image of Dr Johnston was used as the Barclay Perkins logo for many years. Image taken from the http://www.londonremembers.com / website. Windows £51.00 , House Duty £17.00, 6 Servants £ 28 4 s, 2 Gardeners : £12.00, 2 Four Wheel Carriages : £24 14s, 4 Horses : £20 8s, 5 dogs : £2 17s 6d, Amorial bearings £2 8s , Hairpowder : £3 10s 6d and in all the total was £150 14s. In 1837 the property was let by Henry and Frederick Perkins , two of the Perkins sons to David Fletcher for 21 years at a rent of £210.00 per annum. This is when the establishment became known as the Denmark Hill Grammar School. Camberwell though the 1700’s and 1800’s was noted for the number of schools within it’s boundaries. The earlist being the Free Grammar School , also known as Wilsons Grammar School. Camberwell was fashionable, close to London , had clean air and was home to a growing middle class who required a school for their boys. 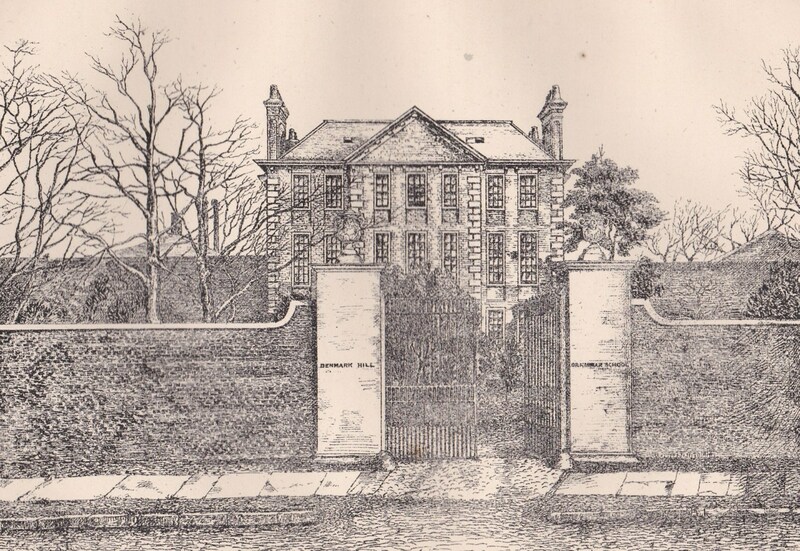 Here is an image from Blanch’s History of Camberwell which shows that gate on the west side of the grounds with Denmark Hill Grammar School engraved on the gate posts. The Denmark Hill Grammar School was a private school where classical languages were taught. David Fletcher was the senior partner and controlled the finances , his family lived in the House. Joseph Payne, according to Richard Aldrich was the Headmaster. He said to Lord Taunton in 1865 “In this school I had the entire charge of the children’s education”. The school flourished, in the 1841 census showed 2 assistant masters, 2 assistant mistresses teaching the junior classes, 57 resident pupils aged from 5 to 15 years. By 1844 there were between 70 and 80 boys in the school. Joseph Payne moved to run Leatherhead Grammar at the end of 1844 and for a while David Fletcher ran the school alone for a few years but in 1850 found a new partner in Charles Mason, They ran the school together for a further three years, Mason suceeded Fletcher and ran the school until it’s closure in 1865. 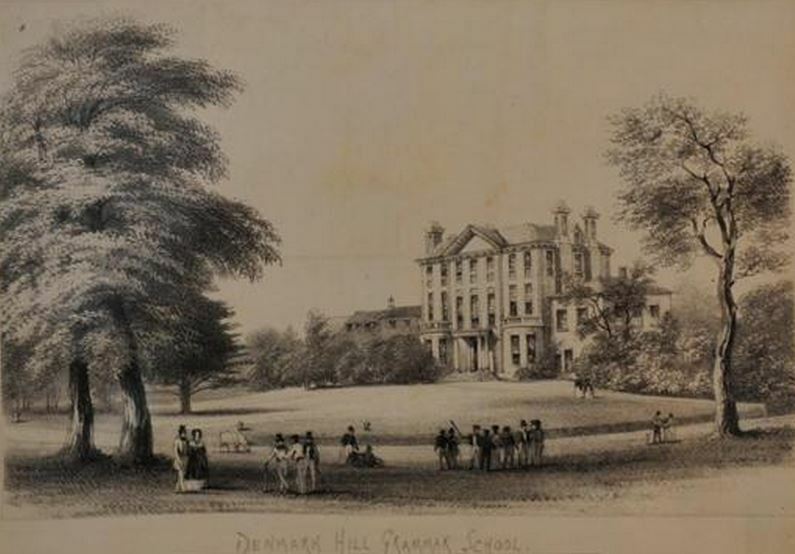 Another image of the school from the east showing the extensive grounds c1855. Found in an auction catalogue for items from the Surrey Cricket Museum. Here is another undated image of Denmark Hill Grammar School frm the East Side, also taken from Old Camberwell by Philip Mainwaring Johnston , published for the Author by JR Wigzell of Coldharbour Lane in 1919. There was a stong academic tradition at the school and a strong emphasis on sport: football in the winter and cricket and fives in the summer. From Blanch a description by Mr Mason of the house ” The house grounds were enclosed by a high wall . The House faced Denmark Hill, and stood only a few yards from the street. Front and back were almost the same , the only difference being in the porches, on one side pillars of Ionic architecture and on the other Corinthian. The material was red and white bricks, panelled and picked out in Portland stone. The estate was sold in 1873, to Mr Churchwarden Strong for £11,000. Within two years the whole estate was broken down and divided into building plots- Daneville and Selbourne Roads laid down and around 200 houses built. Finally, a word about an ever present idea that the House at the bottom of the Hill was built for Prince George of Denmark who in 1683 married Anne, daughter of James 11 and later Queen Anne in 1702. This is repeatedly presented across many local history books , though with the words… no evidence discovered. It is unlikely. 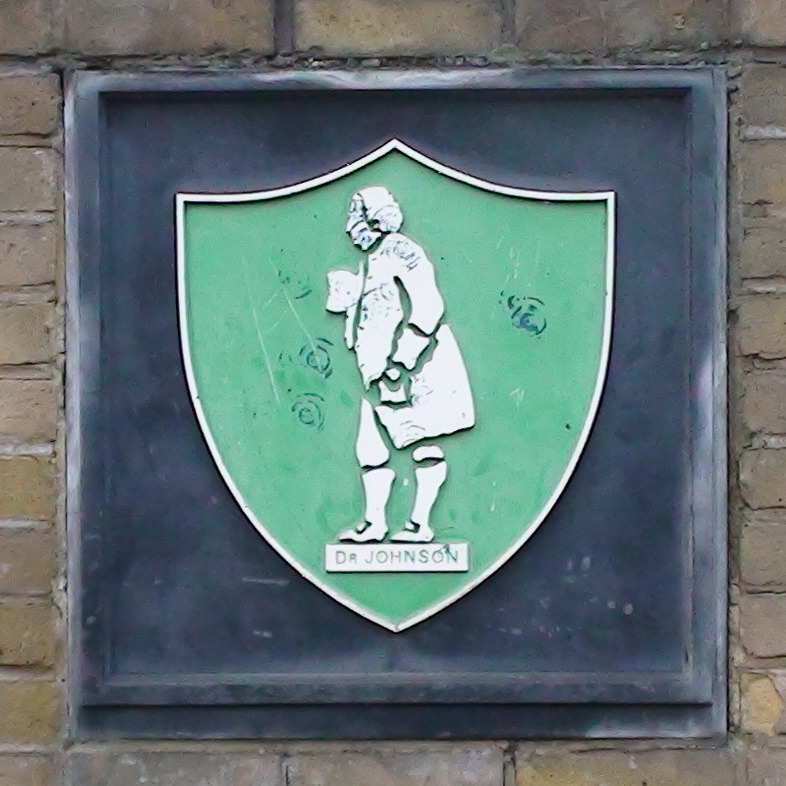 Certainly there was a connection between Prince George and Camberwell and Denmark Hill was supposedly named after him. Prince Georges’s Treasurer, Spencer Compton , Earl of Wilmington lived in Northampton House on the site where the Co-op now is. http://www.merchant-taylors.co.uk/ website of the Merchant Taylors Guild. This entry was posted in Denmark Hill, Denmark Hill Grammar School, Schools, Streets & Roads and tagged Denmark Hill, Grammar School. Bookmark the permalink.